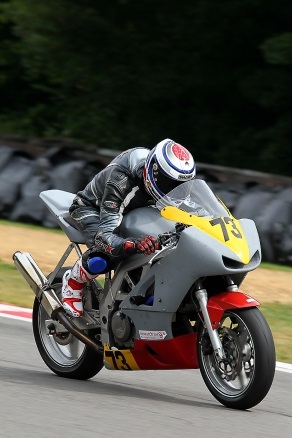 Round 7 saw us back in Kent at Brands Hatch only this time the track was the GP circuit. The GP circuit has a number of fast corners and long straights to get the bikes wound up, unfortunately this weekend I had problems with my forks and a lack of confidence in the front end and my lack of power showed itself on ever straight. I spent much of the race feeling like I was last and I was riding a test session. Saturday was dry. Qualifying was disapointing, I really enjoy the indy circuit and I never expected the GP track to be so different. I completed 6 laps and the fourth was my fastest 1:50.117. This placed me in 27th as the 7th rookie. I started race 1 in 27th and finished in 29th as the 9th rookie. My fastest lap in the race was a 1:47.822. Sunday started out cloudy but dry, we lined up on the grid for race three. I started in 25th and finished 26th, 9th rookie with a fastest time of 1:48.281. Race 4 and I started in 26th and finished in 31st, 9th rookie. My best time was 1:48.949. By the end of this weekend I had completed a total of 22 races with 21 top ten rookie finishes and improved my laptime by nearly 8 seconds.